Blurb: Seven years after the events of The Shadow Dragons, John, Jack and Charles are finally able to return to their beloved Archipelago of Dreams. But even as their return is celebrated by old friends, new concerns shadow the reunion: the threat of Ecthroi, primordial Shadow. And perhaps even worse, the apparent splintering of Time itself. Now, the Caretakers must fight against their most fearsome enemy ever and attempt to restore Time. They must journey through a forgotten Door from the destroyed Keep of Time in order to seek out the Dragon’s Apprentice. If they fail, it will mean the end of both of the worlds. But success will carry its own price – a price that may be too high even for the Caretakers to bear. I am still completely and totally in love with this series. I want to make that pretty clear. 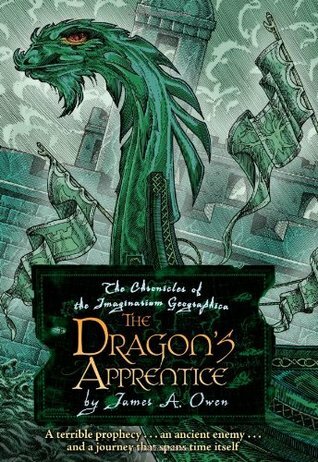 The Dragon’s Apprentice is the last reread in the series, before I get to reading books six and seven for the first time. After the first two books, however, it’s really felt like new reads, probably because my memory is pretty shite (not that I’m complaining, because there are always moments and elements within my favorite books I want to relive as if it were the first time I am experiencing them and The Dragon’s Apprentice is no exception to that). It might also be because of the time traveling aspect. I won’t lie: even though it’s well fleshed out, it still makes my head hurt. I think it’s time travel itself–the very concept of it–that has my brain struggling slightly to keep up and making me wish, just a little bit, that we could go back to the adventures of the first book, before time travel really ingrained itself as one of the main motivators of the plot. That isn’t to say Owen doesn’t do a good job explaining it and how it works. I love how each books elevates how creative time travel, and the ability to do so, gets. That part is fantastic. I think I’m just always going to struggle, at least a little bit, with fully understanding any plot that deals with that concept, including one of my favorite series of all time. I also found myself shaking my head a lot of John and Jack, especially because they continued to ignore those they considered to be “children”–and even ignore Fred from time to time, too, even though he’s a talking dog badger. It was pretty obvious this was going to come back to bite them and I hope it’s a lessen they truly take to heart. I expected more of them (though, none of us are perfect, are we, so I can’t really judge them too harshly, but I couldn’t stop being like, “What are you doing?” every time they ignored Rose or Coal). I also enjoyed some of the new elements in play within this novel: the Mystorians (which I don’t think I spelled correctly, but I don’t have the book handy to double check), the McGee family, getting to interact and understand more deeply with a few more characters–some whose arcs came to some pretty dramatic peaks within this book–plus Theo, who I adored (and whoa, that hurt). Honestly, even though the time travel aspect makes my head hurt a little bit, thinking about this book, there is a lot that I enjoyed. But I’m already itching to go back to the Archipelago. What’s left of it, at any rate.